During the early part of the civilization up to the later decade of the nineteenth century, this barangay was called Quinali, used to be a barrio of the adjacent town of Guindulman. This name was derived from the land formation-sand, gravel or corals piled layer after layer amassed by the seawaves since time immemorial. Immigrants from neighboring places came and settled near the seashore to engage in farming and fishing. This barangay is the focal point of the history of this town. This is where the most important events in town happened and history says it all. When Spaniards came and spread Christianity, Augustinian priests who were assigned in Guidulman wanted to unfold Christian faith to the natives of Quinali. A temporary convent and church were erected in the barrio, Quinali, called a visita. A visiting priest came regularly during Sundays and church holidays to officiate masses. The people through the guidance of the Spanish Priests selected the Señor Santo Niño as their patron. As the inhabitants increased and progressed, they clamored for an independent civil government and parish separate from Guindulman. Strong representations for the creation of a new municipality and petitions for a separate parish were sent to the higher authorities. 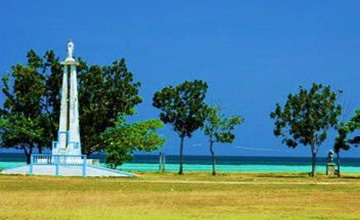 Finally, on March 12, 1875 the civil government was granted to be separated from the mother town of Guindulman by virtue of a directive from the Governor General of the Philippines. Pertinent papers were sent to the Spanish Cortes in Spain for approval. Thus, barrio of Quinali became a separate municipality and renamed in Spanish ANDA, which means that the place is expanding not only in one area but literally walking and moving to prosperity. Time has been kind to Anda. From a small village of Quinali it has already evolved into a Municipality of Anda with sixteen barangays attached. Barangay Poblacion where the seat of local government is located has also progressed and served as a focal point for trade and development in the town. This is also the place where historical sites and events are sculpted. Barangay Chairman CELSO T. MAKINANO JR.
QUINALI BEACH – Noted for its clear crystal water and a huge stretch of fine and powdering white sand. Sunrise at Quinali Beach is always a spectacular dawning of a new day. The glimmer on the still ocean suddenly flashes into sunlight. SANTO NIÑO CHURCH – Parish Church. Secondary Patron: San Agustin. 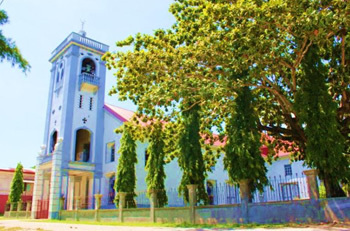 A walk through Anda’s Parish Church is like strolling through the relics of time. The church was built on March 19, 1885 and finished on November 17, 1888. The first Spanish Agustinian Priest is Rev. Fr. Julian Cisnero. One of the finest murals in the province of Bohol is found at the ceiling of the Holy Infant Church. This is the testament of the masterpieces of Raymundo Francia who painted the mural Beside is the Holy Infant Academy which is used to be the Convent of the Agustinian Priests. The church and convento are at the head of an immense open field, at the opposite end of which is a very inviting beach. Old folks say an earlier church stood to the left of the field as one faces the church, slightly across the present convento. This must have been the church referred to in Redondo’s 1886 report: it was built of tabique walls but materials had been collected for a more spacious temple. Preparations for the present church were interrupted in 1898; under the direction of Fr. Carlos Ortuoste, the church was finished in 1926. Parishioners led a vigorous fund drive and also supplied the wood. The women, standing on benches, applied lime plaster to the walls. The church plan follows the form of a Latin cross, and is topped by a low four-sided cupola. The architecture of the exterior is very forthright, with the plain plastered surface enlivened only by doors and windows (This austerity is an authentic aspect which has been defaced overtime, in so many other churches. The belltower attached to the front of the church was started in 1950 and completed in 1952. It is built over a portico, a typical Boholano feature. Portions of the walls at the back were damaged by the earthquake and repaired thereafter. Its plainness inside pushes the eye upward to the marvelous ceiling murals. These were painted in the 1920s by the Cebuano artist Ray Francia, who left his signature in a corner above the choirloft. The paintings on tin sheets portray God and His Kingdom, and create a very tangible illusion of the nearness of Heaven. 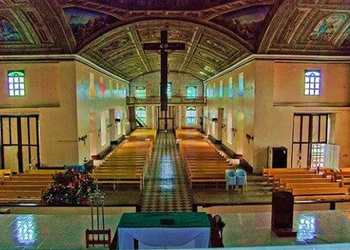 Though some portions over the northern transept were restored after an earthquake, the ceiling remains the best preserved of its kind in Bohol. In the middle of sanctuary is the retablo mayor, with its diminutive image of the parish patron, the Santo Nińo, in the central niche; above is San Agustin, the secondary Patron. On the sides are images of the Sagrado Corazon de Jesus and of the Sagrado Corazon de Maria (left and right, respectively). The retablo mayor and the retablo in the epistle transept carry all sorts of motifs borrowed from Classical Greek and Roman sources. The images featured in the epistle transept are (left to right) Nuestra Seńora del Carmen, Nuestra Seńora de la Consolacion, and Seńor San Jose. The retablo in the gospel transept exhibits a related, but simpler, architectural vocabulary; Featured are images of San Isidro Labrador, Purisima Concepcion and San Roque. Keep an eye out for the confessionals, which have Art Deco elements. This style was prevalent in the 1930s; however the same motifs appear on the belltower adjoining the façade, built some 20 years later. BELLTOWER – One reaches the belltower from the choirloft. There are two bells, one dated 1892, the other 1924. From here one is afforded magnificent views of the sea in front and mountains in the back. One also gets a better idea of the peculiar geographic situation of the town, nestled on a tip of land in between the sea and an estuary. 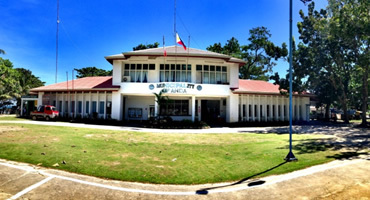 MUNICIPAL HALL OF ANDA – The seat of the Local Government Unit of Anda is located in this barangay. WOODCARVING – The art of shaping statues, ornaments, furniture, and utensils out of wood by means of cutting tools, drills, and abrasives. Various gouges, chisels, drills, and knives then are used for the actual carving. Pieces are finished with rasps, files, and sandpaper. In Poblacion, Mr. Lucino Felisarta and Junie Amper are populary known for their finest craftsmanship in Wood carving. GARMENT INDUSTRY – Poblacion also has a couple of garment industries who make pillows, blankets, beddings, among others. Three major entrepreneurs are Mrs. Anastacia Acebo, Mrs. Concepcion Cerbito and Mrs. Lilia Amoguis. SANTO NIÑO Y STA. CRUS – Celebrated every May 17-18 in Sawang. This is the annual commemoration of the feast day of Sta. Cruz which highlights musical extravaganza, nightly shows, sports activities and Grand Discos. SAN ANTONIO FIESTA CELEBRATION – Held every June 12-13 at Sayga. This is Poblacion’s feast day of San Antonio which highlights another musical extravanganza, entertaining nightly shows, sports fests plus the Grand Reunion of Balik Sayganons.